The McGill administration’s commitment to issues of sexual violence has historically been controversial, and so is their policy against it. McGill’s response to sexual violence has been challenged by students since 2013, when charges were filed against three students allegedly involved in a sexual assault in 2011. At the time, McGill lacked an explicit policy on sexual assault, deferring only to the Student Code of Conduct. 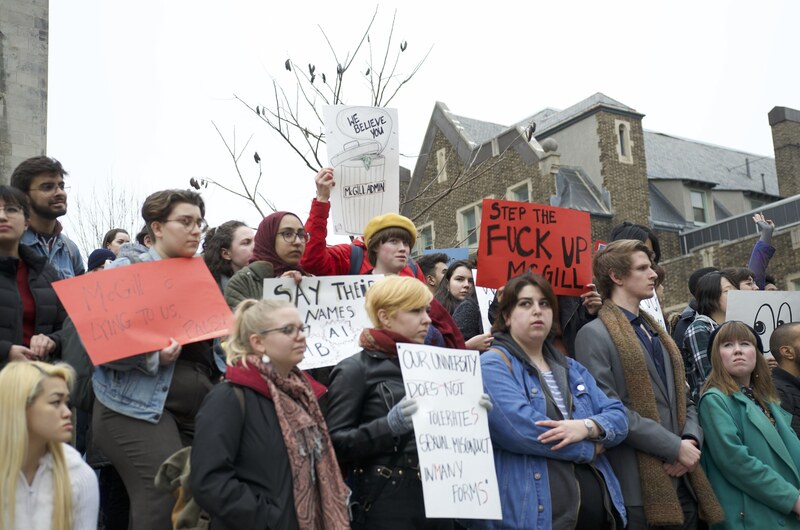 That winter, the administration failed to take action, despite charges being laid against the students 15 months prior, causing organizations like Sexual Assault Centre of the McGill Students’ Society (SACOMSS) to demand action from the University. For the next three years, McGill continued without a concrete policy. The first official version of the policy, drafted in September 2016, was not well received by student groups. SSMU and SACOMSS both deemed the drafted policy insufficient, stating that it showed a lack of commitment to survivors and failed to provide the needed changes to procedures of reporting and recourse. After some adjustments, the policy was officially passed, with approval from students, in November of 2016. McGill’s policy was brought under scrutiny again in early 2018, when students called for a third-party investigation into allegations of sexual violence against several professors. An open letter penned by SSMU and signed by over 100 student groups and 2,300 individual students expressed dissatisfaction with the administration’s lack of response to repeated complaints of sexual misconduct from five different faculty members. Again, students found the policy to be lacking a clear procedure for reporting and filing complaints of misconduct by faculty. On April 11, 2018, students at McGill and Concordia walked out of their classes to protest the mishandling of complaints by the administration and to call for thorough investigations into the allegations. On April 17, executive members of SSMU and PGSS sent an additional open letter, this time to Quebec Minister of Higher Education Hélène David. The letter reported McGill’s failure to comply with the mandate of Bill 151, a policy aimed at preventing sexual violence in post-secondary institutions, and pointed to how mechanisms of recourse and accountability have failed at the University. On May 10, 2018, Vice-Principal Christopher P. Manfredi introduced an Ad Hoc Senate Committee on Teaching Staff-Student Intimate Relationships, which was in charge of gathering testimonies and creating a more extensive draft of existing policies and regulations. In July, 2018, a Gendered and Sexual Violence Policy Report was released, written by students Caitlin Salvino, Bee Khaleeli, and Priya Dube. The report outlined recommendations to the administration to include a revised policy, as well as the history of gendered and sexual violence at McGill. In the December 5, 2018 Senate meeting, the Ad Hoc Committee on Teaching Staff-Student Intimate Relationships delivered their report, concluding that relationships between students and teaching staff would be prohibited with two exceptions. The recommendation failed to meet students’ previous consensus on the need for a full ban. This year, on January 1, McGill (along with UQAM and several CEGEPs) failed to meet the provincial deadline to adopt an approved policy, as mandated by Bill 151. McGill administration argued that it had not, in fact, failed to meet the deadline, since there was a policy in place. McGill’s current policy, however, received a C- grade from student-led advocacy group Our Turn (now Students for Consent Culture Canada) because it is not a stand-alone policy and still refers to the Student Code of Conduct in regards to disciplinary measures. For a week in February, SACOMMS hosted a series of student consultations as part of ongoing revisions to the policy, in order to compile a report for the administration and the Sexual Assault Policy Working Group. Despite the revisions and consultations, students feel the policy is still lacking, citing the complex procedures, vague definitions, and lack of accessibility for disclosure. Following last month’s consultations, the revised policy will be debated in the next Senate meeting on Wednesday, March 27.